Instructor User Guide MessagesHow do I move a message? A message can be moved from one folder to another for organizational purposes. Open the folder containing the message to be moved. Select the folder name of the folder containing the message to be moved. 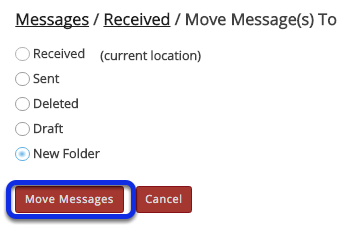 Select the checkbox to the left of the message to be moved. Select the new folder for the message. 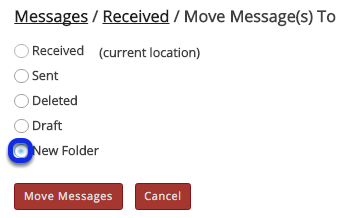 Select the folder where you would like the message to be moved. Select Move Messages to complete the move. Prev: How do I create a Messages folder? Next: How do I delete a message?